Onion ingestion is the third most common poisoning vets see in Adelaide. Like so many pet poisons, onion is a trap we accidentally lay for our pets. Cooking and leftovers are the problem. Raw onion advertises its toxicity so well that no self-respecting dog or cat would eat it. Add a bit of heat, some other ingredients, and suddenly it’s nice and tasty without the unpleasant warning flavours that keep our pets safe. How Much Onion Is Dangerous? All dogs who eat onion should be made to vomit as susceptibility varies. Exposure is cumulative. The lower line on the graph at the top shows how slowly dogs recover. Any more onion in this period will add further damage and increase risk. *The study (link below) used 5g/kg of dehydrated onion, which is probably equivalent to cooked onion. An equivalent amount of fresh onion would be heavier. Some of the dogs developed life-threatening anaemia so the hazardous dose is clearly lower; I have arbitrarily chosen half. Is Garlic Toxic To Pets? Isn’t it strange that humans can happily eat onion but many other animals can’t. The reason is quite unexpected: it’s all about antioxidants. 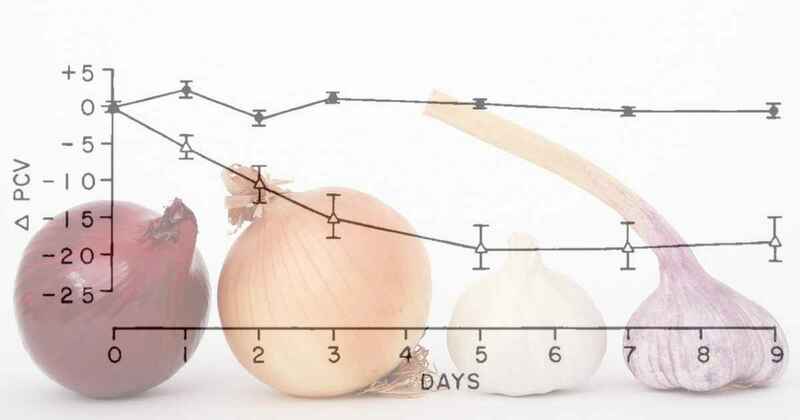 Onion, whether cooked or raw, contains sulfur compounds that cause oxidative damage. The red blood cell in dogs and cats has a low antioxidant capacity. Put these together and disaster ensues. The result is anaemia and a reduced ability to deliver oxygen to the body. You might also notice red urine and yellow eyes from pigments released by the destruction of red blood cells. Dogs that have eaten onion within the last hour can be treated simply by making them vomit. After this time it’s likely that some will have been absorbed. If so, vomiting may still be worthwhile followed by a dose of activated charcoal. However, there is no antidote for the toxin that reaches the bloodstream. These dogs need daily monitoring via blood tests. Some will need oxygen support or transfusions but the good news is that most will recover uneventfully.